The $130 million 40-turbine project, which is estimated to produce 90 megawatts total, will have the capacity to serve roughly 27,000 households with electricity, according to NextEra spokesman Bryan Garner. Construction began in May and is expected to conclude by year’s end . . . Along with South Sioux City, some beneficiaries of the project include the Northeast Nebraska Public Power District and the cities of Fremont and Wayne. 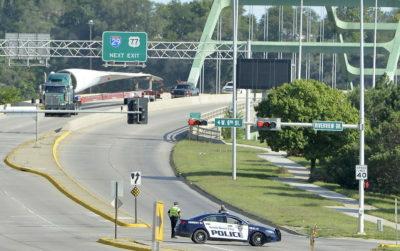 Photo credit: Tim Hynds, Sioux City Journal file: A truck carrying a wind turbine blade crosses the Veterans Memorial Bridge into Dakota Avenue in South Sioux City on August 25, 2015. Two Midwest Utilities achieve high ranking on efficiency scorecard, Midwest Energy News. Despite relatively low electricity prices in the Midwest, utilities based in Minnesota and Illinois are among the most energy efficient in the country, according to a recent report by the American Council for an Energy Efficient Economy. Meet the young conservative behind Missouri’s fast-growing solar company, St. Louis Post-Dispatch. Last year, Sun Solar ranked at No. 156 nationally on Inc. magazine’s annual list of the fastest-growing private companies in the U.S. It was named the country’s ninth-fastest growing energy company, and the second-fastest growing company in Missouri overall. Small utilities score huge victory in California aggregate net metering case, PV Magazine. Under a new ruling by the California Public Utilities Commission, small utilities can now allow customers to unify multiple meters under one bill for net-metering purposes because it will have no effect on non-solar customers. U.S. Renewable Energy Groups Share a Vision of the 21st Century Power Grid, Solar Energy Industries Association Blog. In “A Shared Vision of the 21st Century Grid,” the groups highlight mutual support for market structures that appropriately value new and existing technologies, tax policy continuity and parity for all renewable technologies, and the expansion and modernization of the electrical grid to support the proper operation and integration of clean power sources. 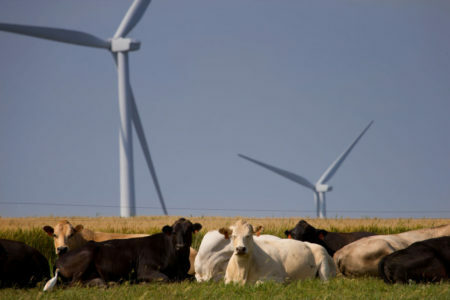 This entry was posted in Nebraska / Midwest News, NewsBlog and tagged Midwest renewable energy deployment, national renewable energy news, renewable energy development in Nebraska, U.S. energy storage news on June 19, 2017 by Helen Deffenbacher.